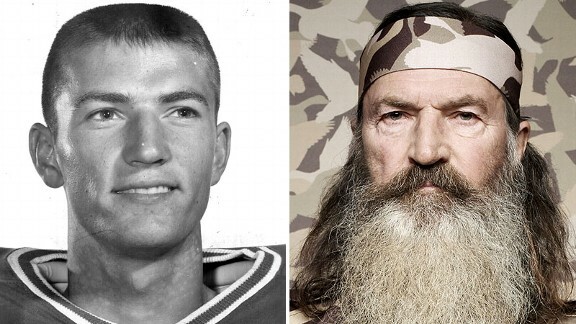 How does that saying go?….”You learn something new everyday” well it’s true, I found out from my parents, who watched Jay Leno the other night that Terry Bradshaw “rode the pines” in college to none other than Phil Robertson, of Duck Dynasty fame. What?!? How could that be? Have you ever seen Phil? 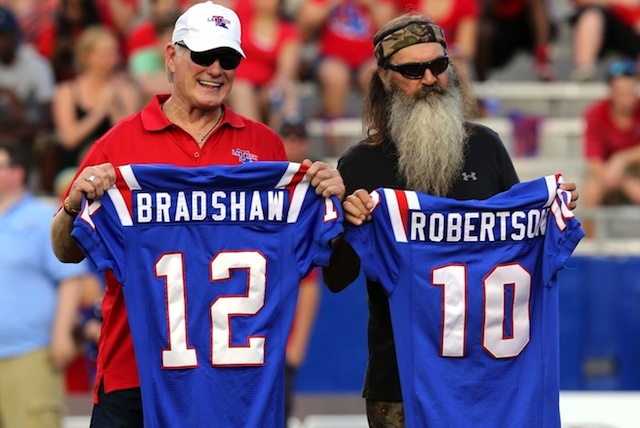 According to Bradshaw, Robertson’s game kept Bradshaw off the field his freshman at Louisiana Tech, despite Robertson being late for both practices and games. So while #12 aimed for receivers down field, #10 aimed for ducks in the sky…and both knew what was best for themselves and ended up extremely successful. 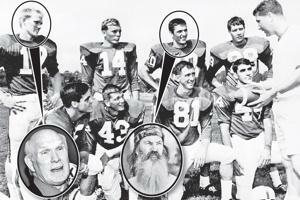 This entry was posted in college football, Football, Hunting, sports and tagged Duck Dynasty, Jay Leno, Louisana Tech, Phil Robertson, Terry Bradshaw. Bookmark the permalink. What are the chances that Phil will ever wear that jersey?